“Historic American Buildings Survey, August, 1971 GENERAL VIEW OF INTERIOR. – Presbyterian Church, California and Sixth Streets, Jacksonville, Jackson County, OR HABS ORE,15-JACVI,60-8” by Jack E. Boucher – http://www.loc.gov/pictures/item/or0068.photos.129783p. Licensed under Public Domain via Wikimedia Commons. 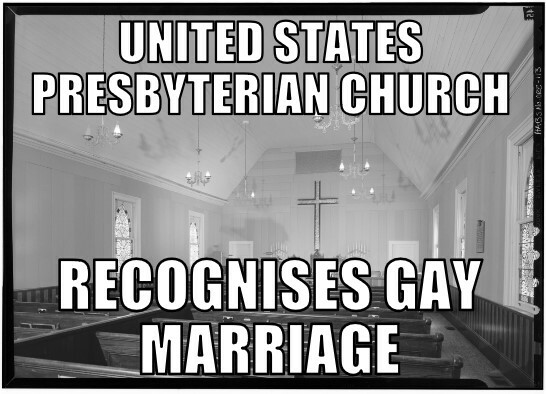 This entry was posted in Gay Marriage, Memes, News, Presbyterian and tagged christian, church, gay marriage, legal, meme, memenews, memes, news, Presbyterian, religion, united states. Bookmark the permalink.